Another short update. I'm lacking inspiration on the landing gear. I want something that is separately cast but easy to assemble to the model. 4 legs/pads. It also needs to support the weight of the rest of the model. I'm also not sure whether I would be able to cast this and be able to get the spring section out of the mold? In addition I was going to drill suitable locating holes on the underside of the main body. I'm having a nightmare drilling into the resin because where i need to put the holes is a curved surface, and the drill continues to slip before biting so i end up with holes that are up to 2mm out of place - doesn't sound like much but its stands out a mile! help! As always, suggestions comments and critisms are very welcome. Pilot holes are your friend. 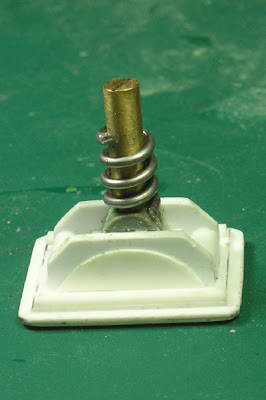 Drill a small hole where you want the hole to be, then use that to hold your drill bit in place. If your hole needs to be at an angle to the surface, start with a perpendicular hole just enough to get a depression in the surface. Then slowly move the drill until it is at the angle you want. Don't push in while you're doing this, just change the angle. Try it on something you don't care about first. Check out GW dreadnought feet. being a tech I advise the juse of Hydroliek shock absorpers.